In case you, like me, have recently had an increased thirst for nature adventures, you’ve come to the right place. Welcome to Montenegro, the country of lazy Balkan inhabitants (fun prejudice admitted even by the Montenegrins), big national pride and incredible achievements considering the country’s size and age. 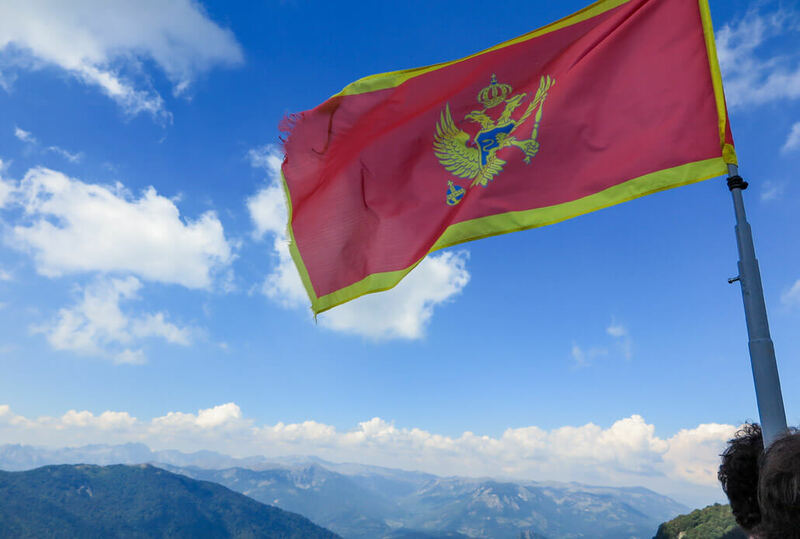 Montenegro has existed as a sovereign state since 2006. There are currently a little more than 600,000 inhabitants. Almost everyone who visits Montenegro heads to Kotor, the picturesque seaside town with beautiful fortifications and old walls, which sits so conveniently in the Bay of Kotor, making it accessible even for large cruiseships. 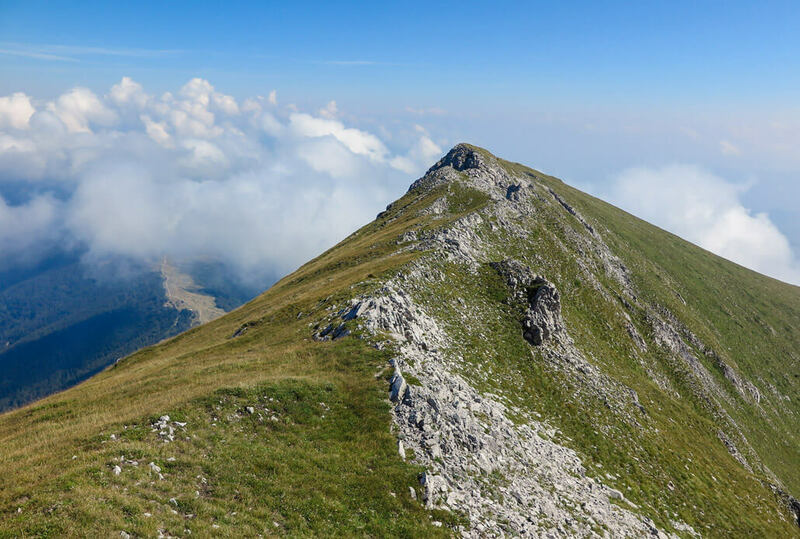 Today I’d like to convince you to visit the mountains of Montenegro. Because they are stunningly beautiful, peaceful, mostly empty and well marked. See the layered rock? One can really see the remnants of the creation process here. 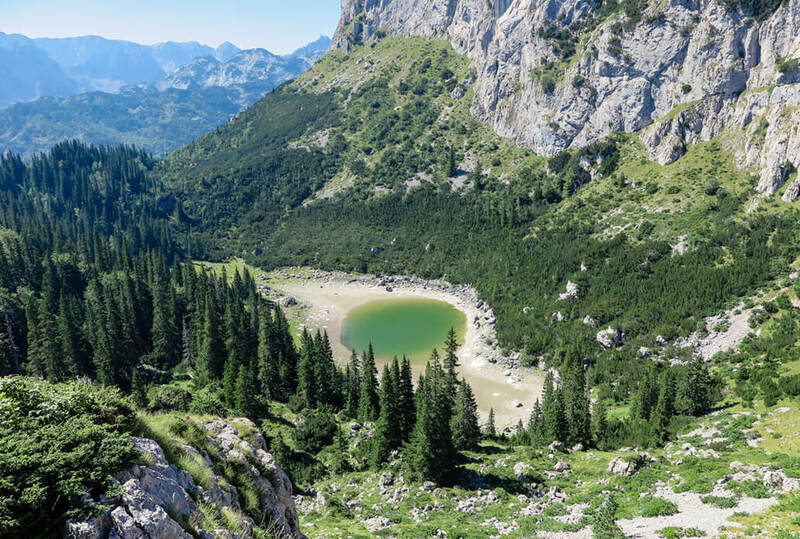 Let’s start with the incredible Durmitor National Park, located in the North of the tiny country. A UNESCO World Heritage site since 1980, this National Park is truly one of a kind. It was formed during the Ice Age as a massif as this area was heavily glaciated. You can still spot the remnants of the creation process – things like glacial lakes, canyons and caves. 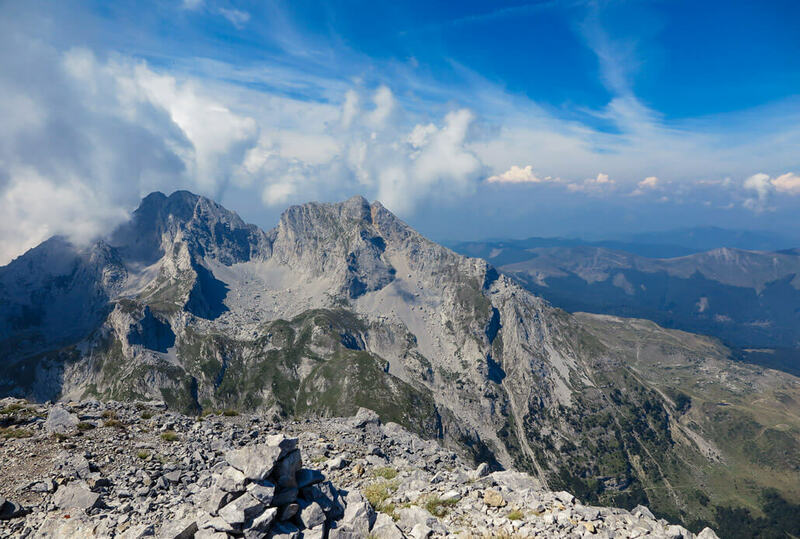 It’s one of the most beautiful mountain ranges in all of the Balkans. 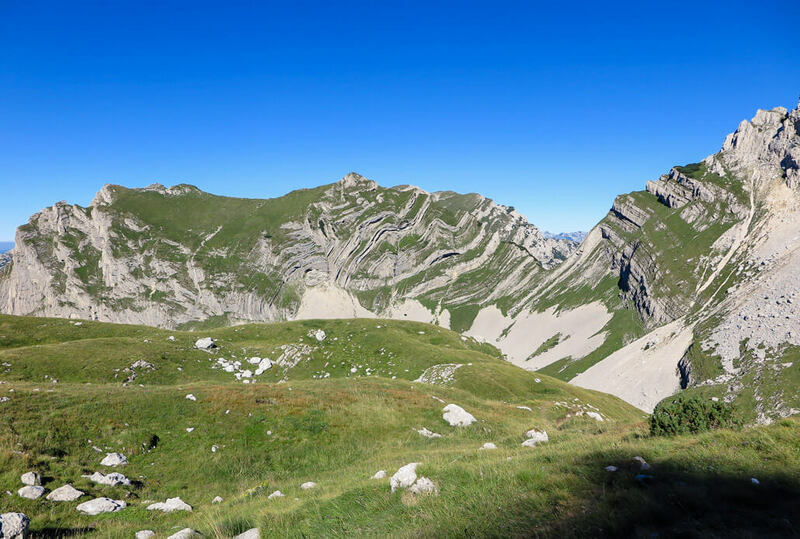 As opposed to other National Parks in Europe that are largely discovered, this one is relatively unknown and thus you’ll encounter pristine nature without hoards of tourists. There are also bears and wolves, but you’d be extremely lucky to even spot any. 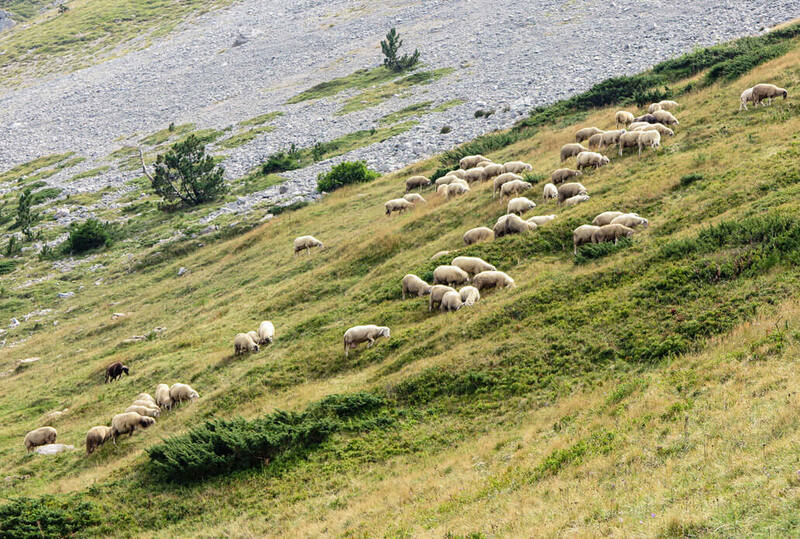 You’re more likely to see sheep, friendly dogs and other domesticated animals. Meaning ‘Red beam’ in English, this table mountain stands out not only for its natural beauty and the magnificent views it offers, but the amazing diversity of lakes surrounding it. You’ll pass by lakes on your way up, down and around and will be stunned by the views from the peak. Tiny lakes glitter and beg to be photographed – what more can one ask for? You’ll pass by Jablan Lake on your way up and you can choose a path that goes by Zminje Lake (meaning ‘Snake Lake’) on your way down. 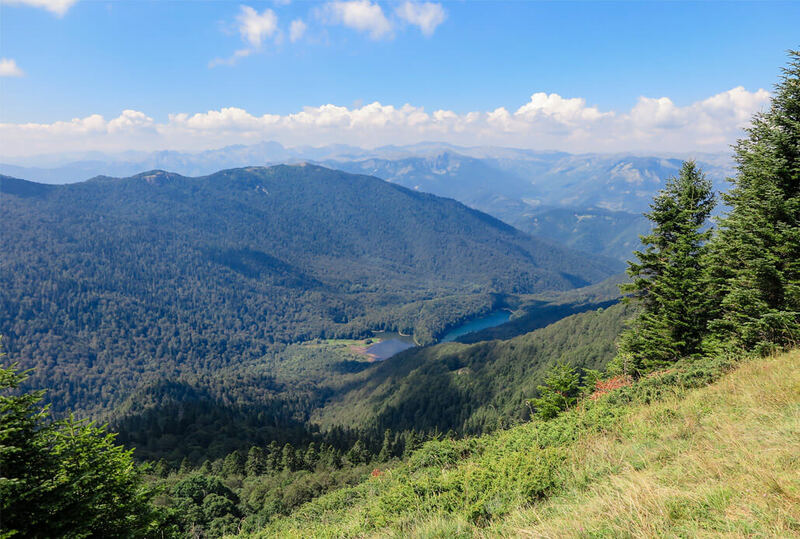 From the top of Crvena Greda, you’ll be able to spot the uniquely shaped Crno Jezero, the ‘Black Lake’. But don’t be fooled by its name; the water is a beautiful turquoise color! The way up is strenuous, but it’s not too bad. Toward the very top, you’ll have to fight your way through small pine trees, but it’s more just a visual obstacle. You can plan a full day hike up to the peak and around the lakes. But if you’re pressed on time, the hike up and down Crvena Greda can be managed in half-day too. 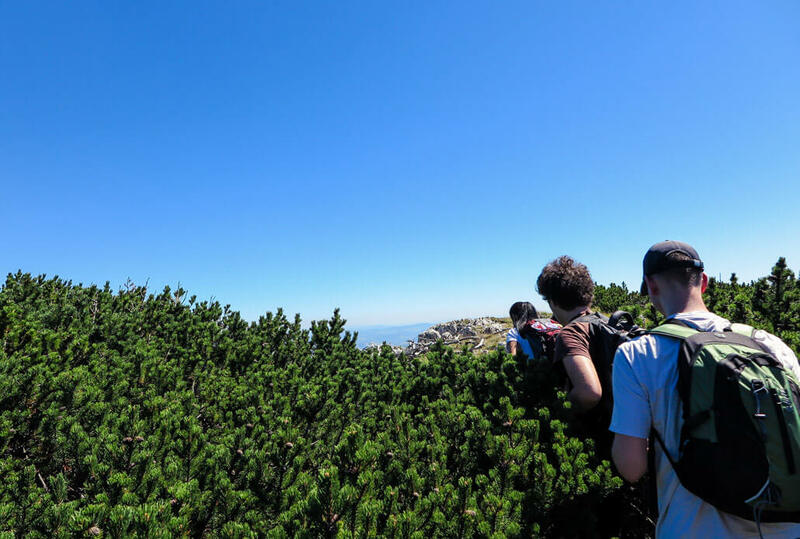 Nearing the top of Crvena Greda – in a pine sea! View from the top of Crvena Greda: there’s the Black Lake! 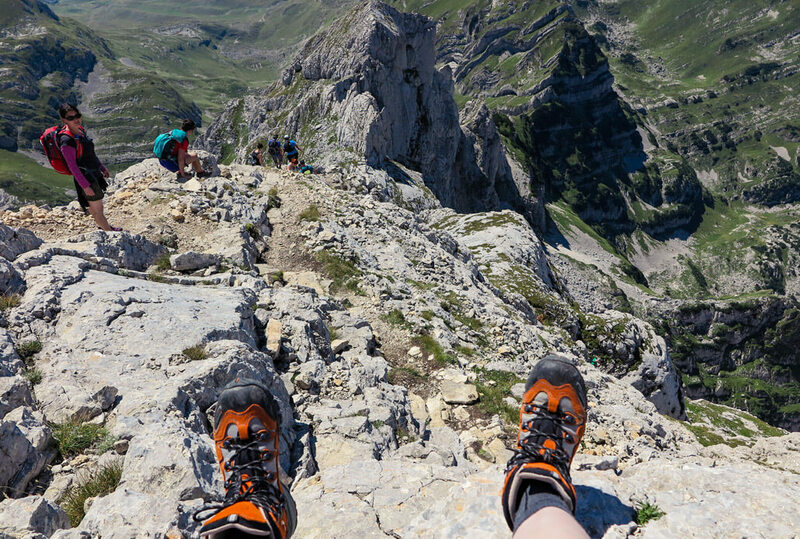 Check out more on hiking Durmitor and other trails in Europe here. Count with a full day for trekking up to the incredible Bobotov Kuk. I found the trek to be quite challenging, but I’m a very amateur hiker. In my opinion, anyone in decent shape could handle the elevation (850 m). 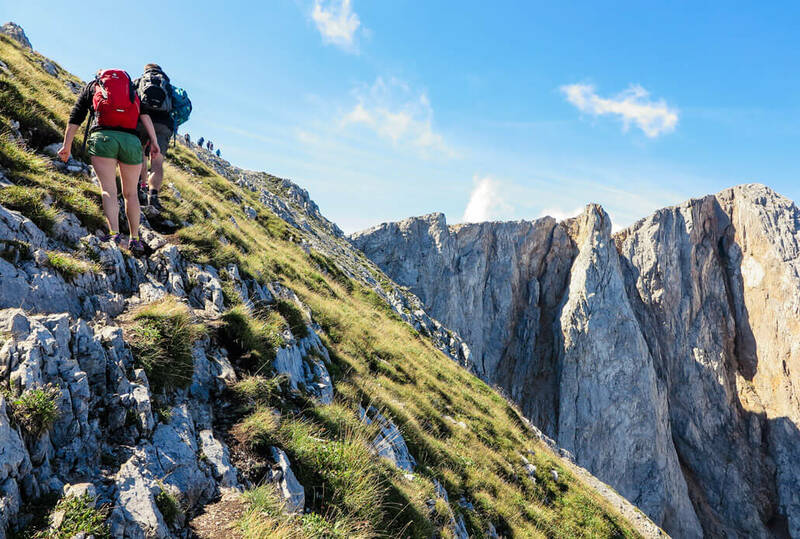 Sure, it’ll cost a bit of sweat and tears, but the incredible views from the top are well worth it. I only wouldn’t recommend climbing the few last meters to people with serious vertigo issues. We first drove to a saddle, which was already in the height of 1907m, and started the trek from there. You can find the exact spot by googling Sedlo 1907 in Durmitor. For Bobotov Kuk, you’ll need some real mountain boots (like these for women OR these for men). The terrain varies, but you’ll encounter parts that are made up of slippery rocks of all sizes. Trekking poles would come in handy too. I didn’t have them and my knees were not happy. Nearing the top of Bobotov Kuk.. hard to focus on the most challenging last meters with these views all around! Absolutely breathtaking views from the top of Bobotov Kuk… well worth the challenging trek! Getting down from Bobotov Kuk’s very peak.. better don’t slip! 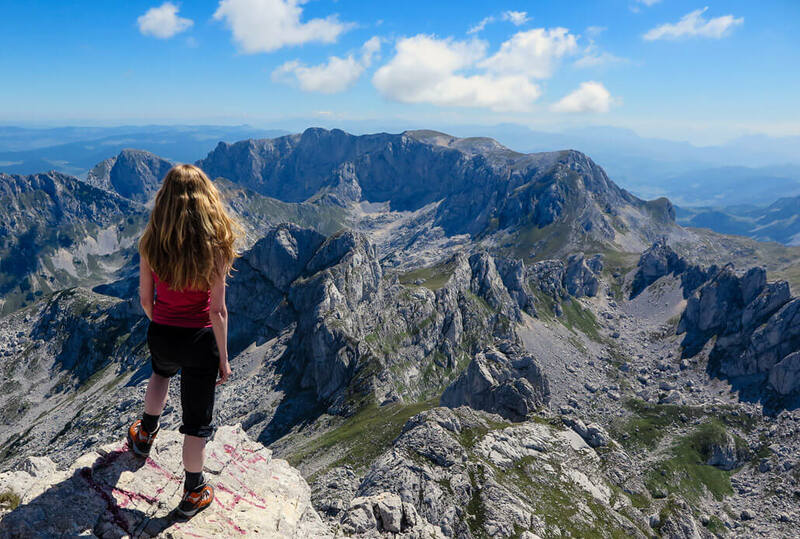 While the amazing peaks of Durmitor are guaranteed to take your breath away, the opposite extreme is similarly stunning. The canyon the local river Tara has created is the deepest in Europe, and actually only the second deepest worldwide, after the American Grand Canyon. 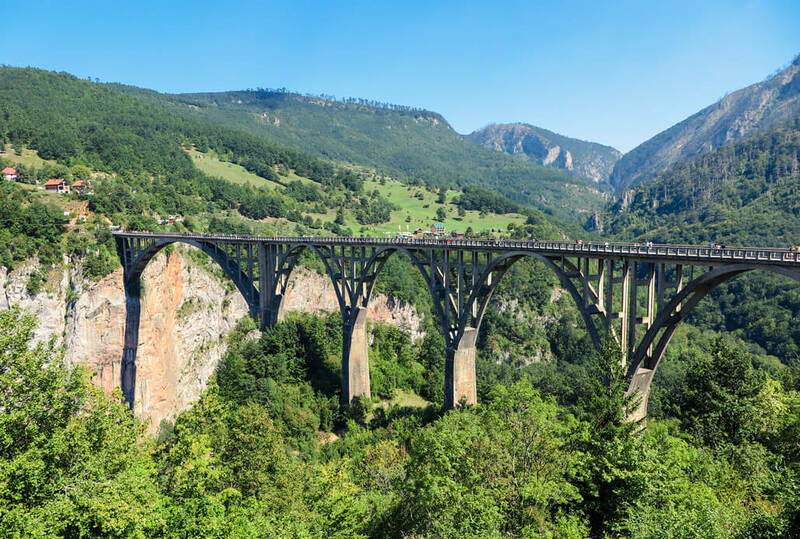 On a few spots it’s as deep as 1,300 m.
You can enjoy the views from the Đurđevića Tara Bridge, a beautiful concrete arch bridge, which is supposed to be among the top 20 bridges in the world. If enjoying the views while just leisurely walking on a bridge is not enough adrenaline for you, you can try a zipline! There are two zipline providers, one offers a ride for €10, which is by a few seconds shorter and slightly less fancy. I took it and loved it and screamed the whole time. :) The pricier option, costing you €20, is a bit cooler and you sit in a more comfy-looking apparatus rather than just strapped to a pulley. To experience the thrill of Tara River, try whitewater rafting. There are several providers, all have their shops set up near the Bridge. Typically, a rafting tour ends with a swim in the Crno Jezero, which is cold but beautiful! 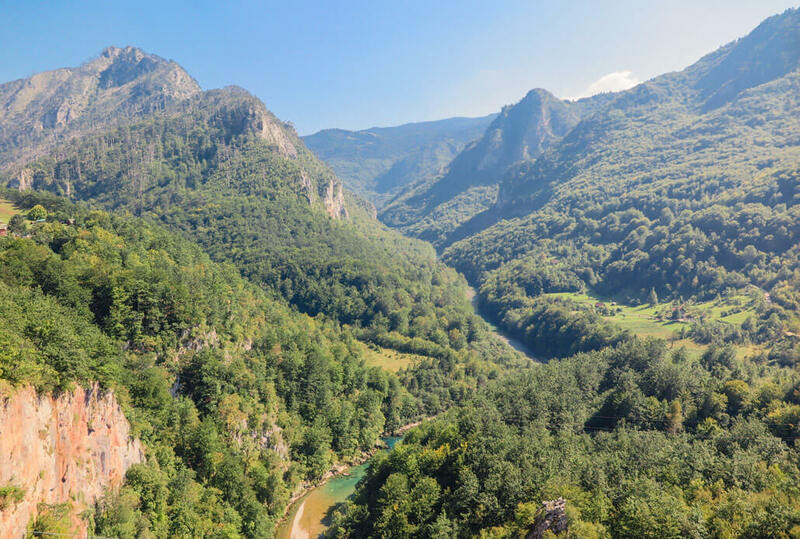 There’s also the option to book a rafting trip to the Tara River Canyon in advance: either from Žabljak or all the way from Kotor. See why this bridge is among the world’s most unique? View of the Tara River Canyon.. with the river water alternating between earthy to turquoise. 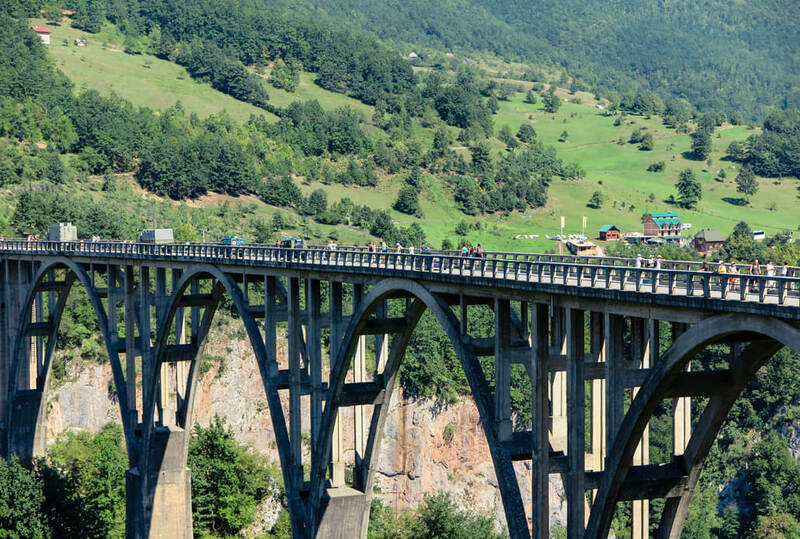 To have the best view of the deepest part of the Tara River Canyon, climb up to a viewpoint called Ćurevac. It’s a short hike up, provided you have a car and can drive to the foot of the hill. Yet another stunning view of the Tara Canyon: Curevac! 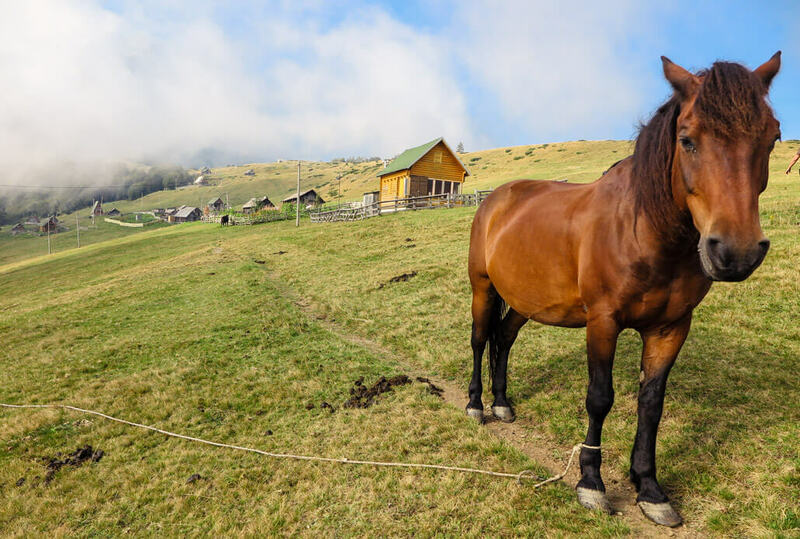 You’ll want to stay in the city of Žabljak or in the surrounding area in order to easily reach the trails leading up to the mountains and to the lakes of Durmitor. 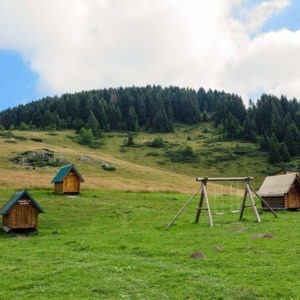 We stayed at the Mlinski Potok Campsite, which featured options of staying in your own tent or in small cabins. It was a really nice area, and waking up to see the mountains lit up by the early morning sun was truly special. If you’d prefer something more private and with a higher chance of hot showers, check out other plentiful accommodation options available in the area. The view from my tent in the Mlinski Potok Campsite. 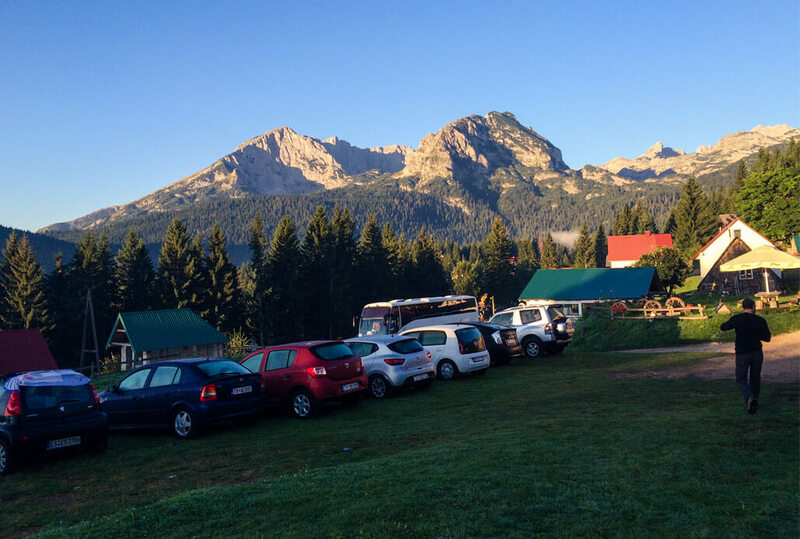 Read more about Durmitor National Park here. 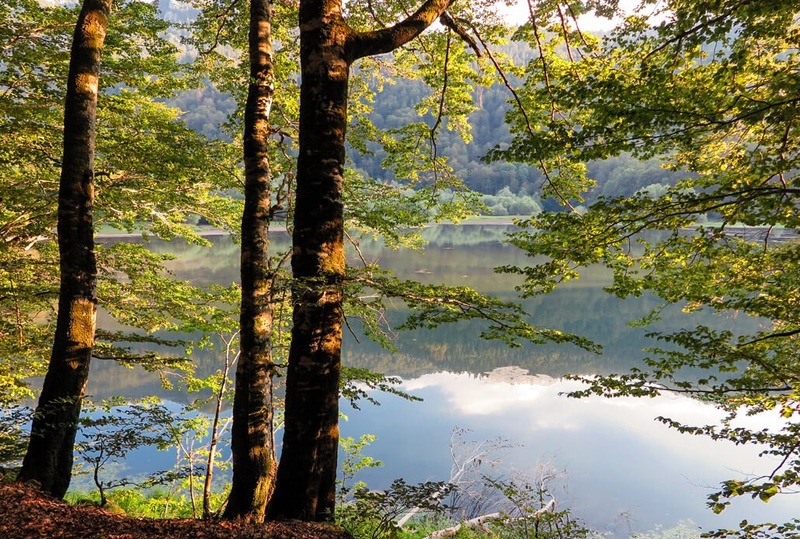 The highlight of Biogradska Gora NP lies right at its heart: Biogradsko jezero, or Beograd Lake in English. 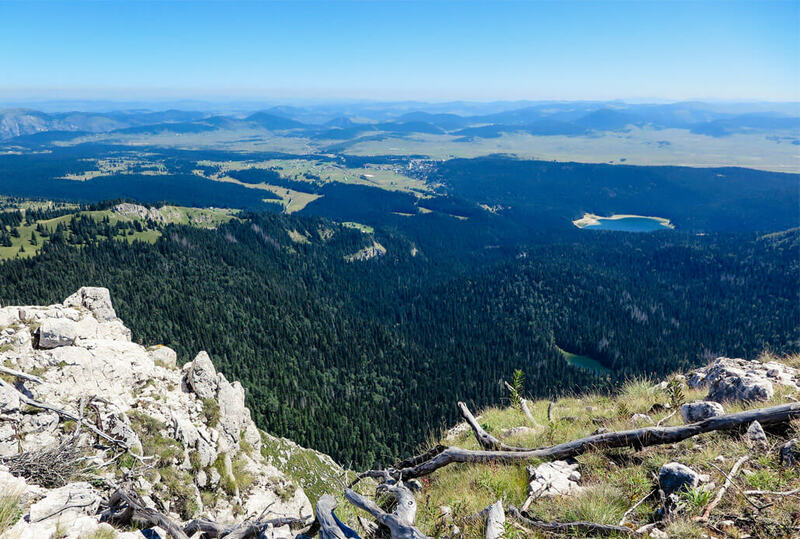 The Bjelasica Mountain Range – the underlying mountains – is of a volcanic origin. You can find one of the largest virgin forests in Europe there. 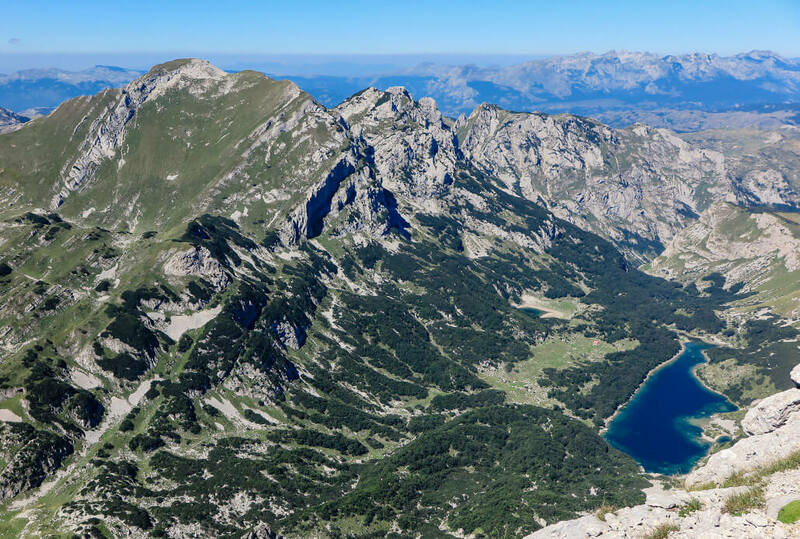 It’s no wonder that this National Park is officially the oldest one in Montenegro, being founded in 1952. 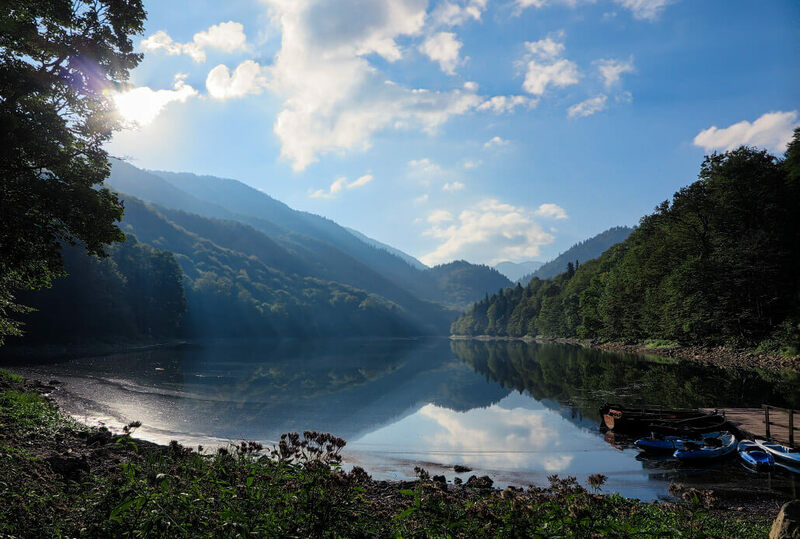 Biogradsko Jezero is one of the many glacial lakes in the area and lies in the height of 1,094 m. This lake in particular is the largest and possibly also the prettiest. You can enjoy the walking path around the lake, which takes approx. 1 hour. The lake is nice and clean and if you’re staying in a tent, you’ll need to jump right in it to stay clean. There are no communal showers by the Biogradsko lake. 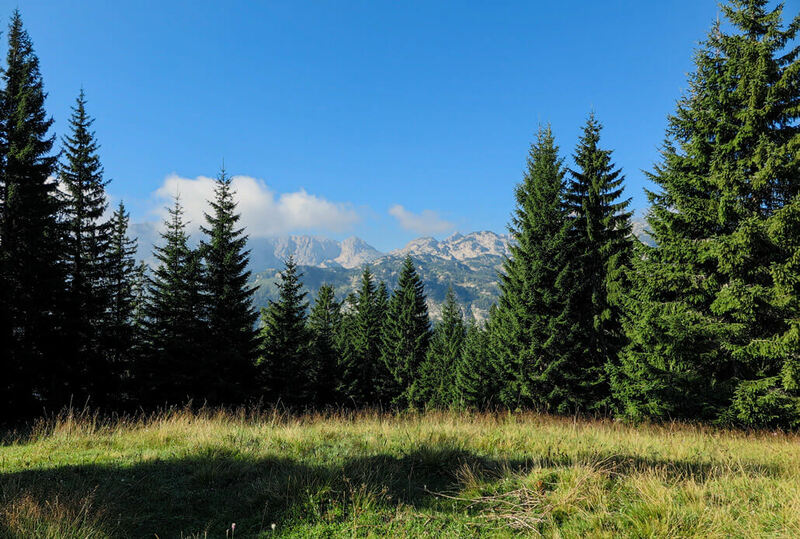 For bigger hikes, though, there’s the option to hike the Bjelasica Mountains, in and out of the ‘border’ of the Biogradska Gora NP. Katun Dolovi Lalevica (Kamp Janketic) – recommended for eating! And sleeping, if you feel like spending the night. 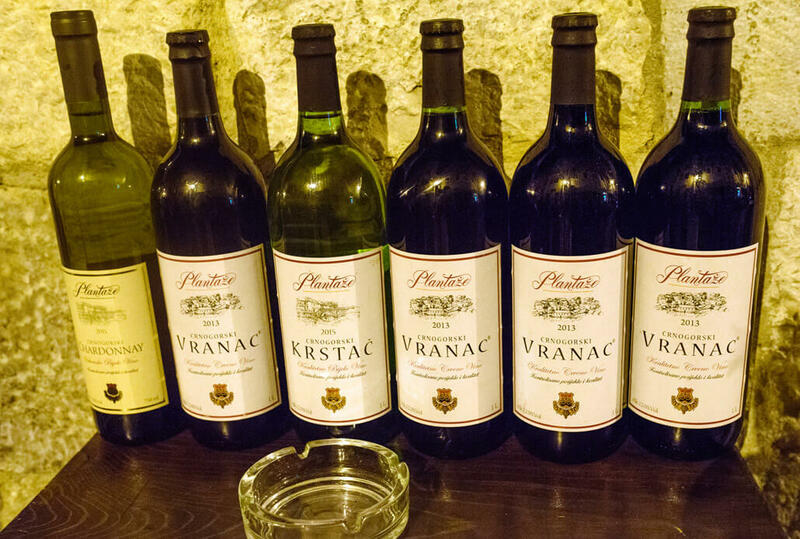 Damjanovića Kolibe – ideal for chilling & drinks. Food is good too, but it seems more basic. There are several viewpoints in the area, like e.g. Bendovac, which is around 2-3 hours hike from Biogradsko Jezero. 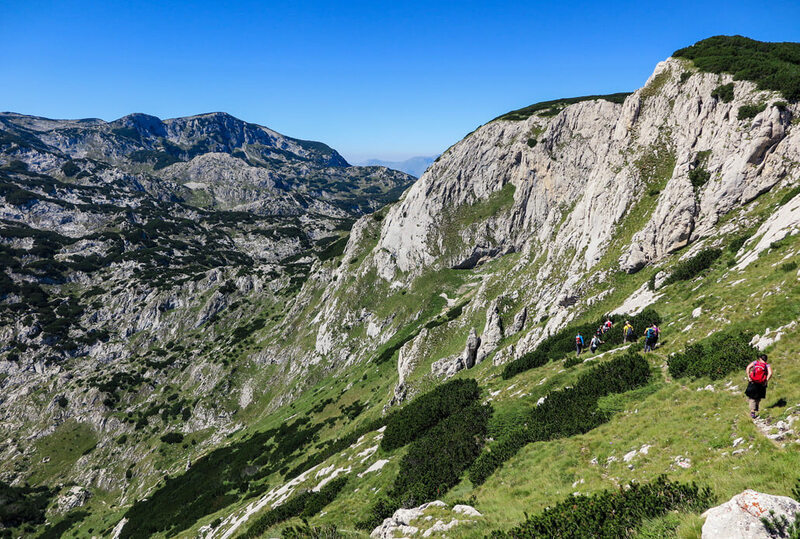 Exploring parts of Bjelasica Mountains comes in handy in between more strenuous hikes in the mountains. Views from Bendovac viewpoint.. of course there’s a lake to see! You can stay right by the lake! That is, if you don’t mind pitching a tent in a forest. Alternatively, you can stay in a few cabins that are right by the lake too. Check out this overview by Visit Montenegro. Another beautiful accommodation option in the area is Eco Village Goles. I haven’t actually seen this one, but it looks wonderful on the photos! Yet another stunning trek up to the top of the world. That’s how it felt to me. 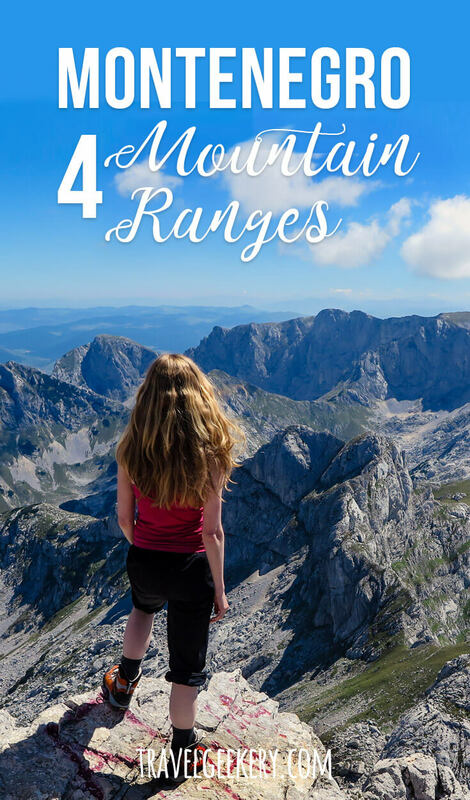 The Komovi mountain range looks different from Durmitor, although it’s hard to describe exactly why. Perhaps there are fewer trees around and the landscape appears more barren. We hiked through the Stavna Plateau (we stayed just below it) and then further up. Most of the time you’ll be climbing sideways along the mountains edges. You’ll basically circle it several times till you get to the top. We saw two hikers who tried to go a more direct route (unmarked path) but quickly gave in. Our destination, Kom Vasojevickij, hiding under the thick morning fog. 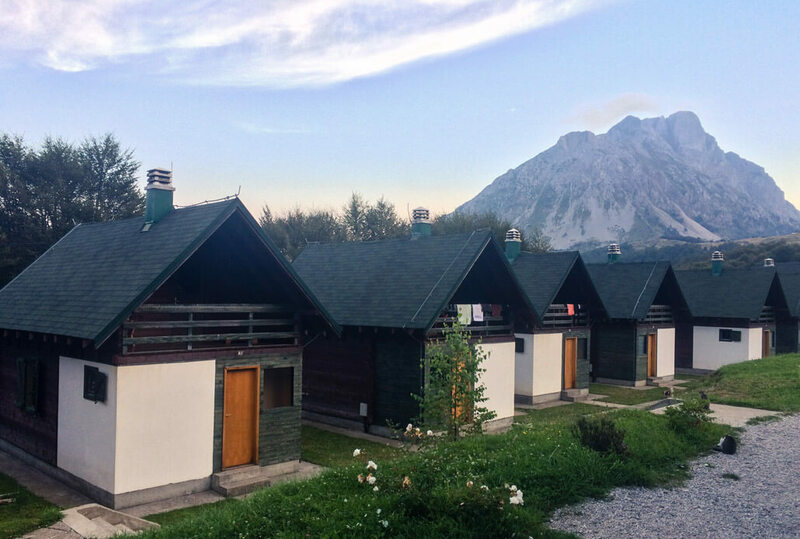 Stay in one of their little chalets, right at the foot of the mountain. They have all the facilities you might need, including a great restaurant with local delicacies. 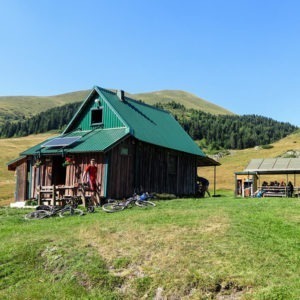 Not only it’s located in nature with beautiful mountains surrounding you, but it’s also been built as one of the first ecotourism accommodation options in the area. 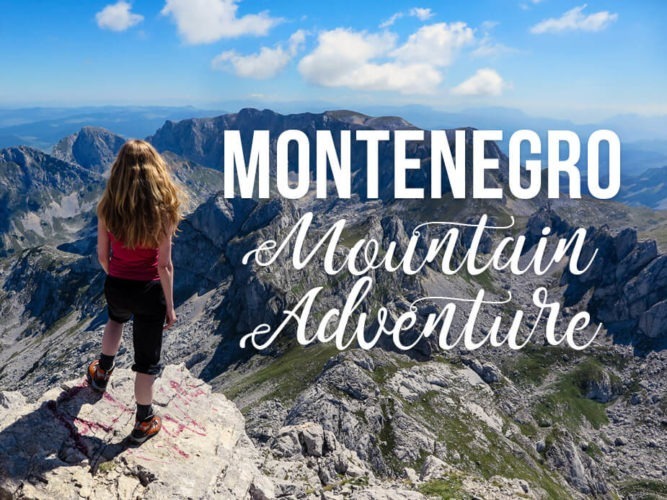 I haven’t visited these mountains particularly, but together with Durmitor and Komovi, they form a natural triad of the best mountaineering adventure Montenegro has to offer. Montenegro shares Prokletije Mountains with Albania. 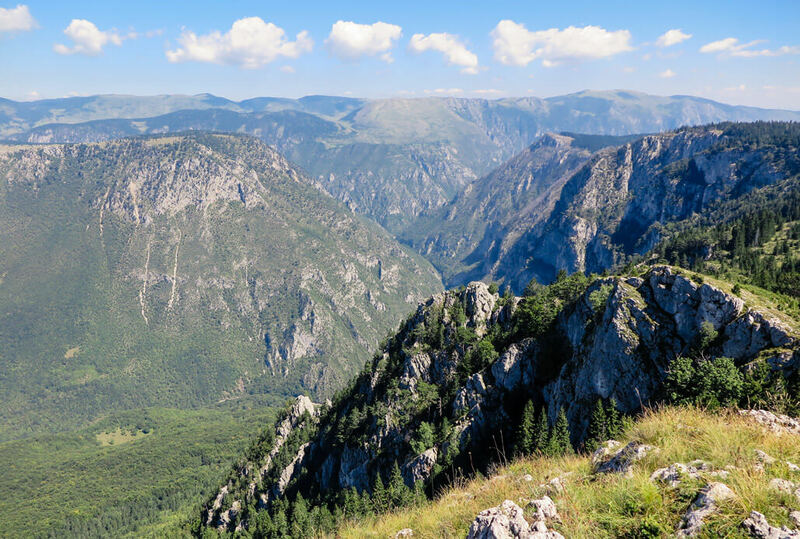 There’s one National Park in the Prokletije Range located in Montenegro, and two in Albania. A fourth one might be created in Kosovo. 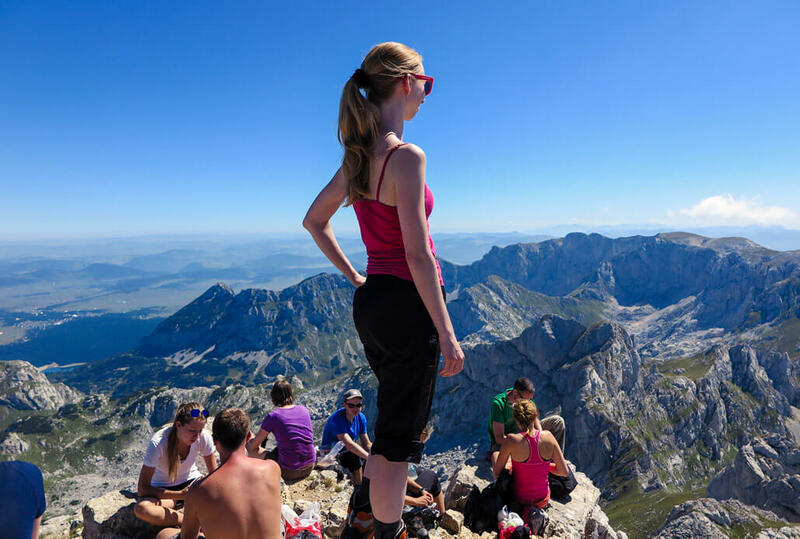 There are a few individual mountains with good hiking opportunities in Prokletije. 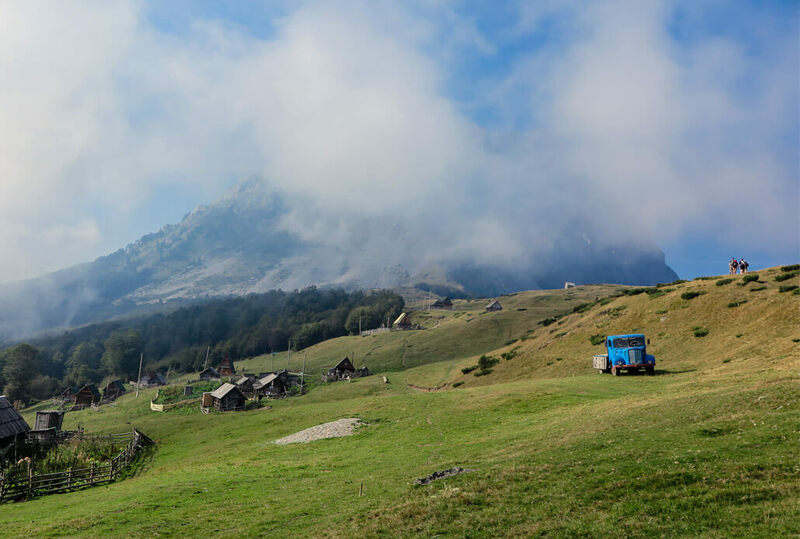 Apart from the actual peaks, you should check out the Plav Lake and Ali-Pashas Springs. 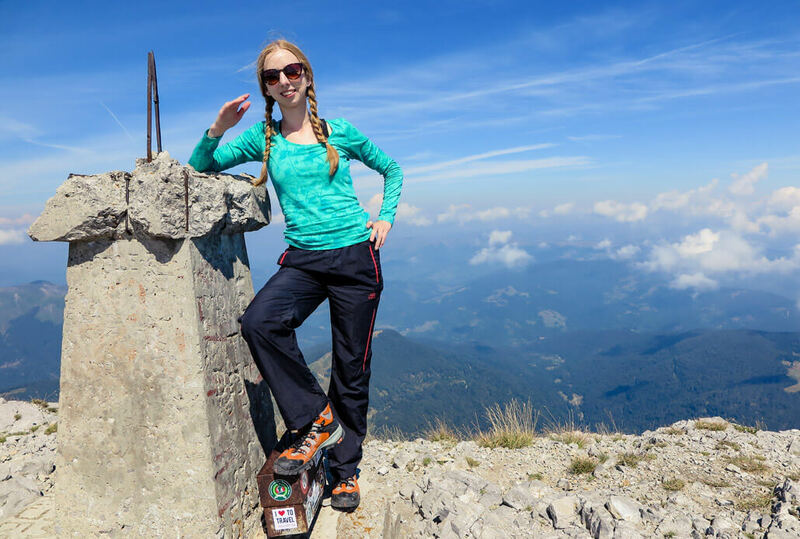 If you make it to either peak in Prokletije, let me know how it was! 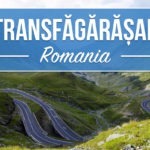 I’ll gladly add it to this post, so that other adventure travellers can use the information. Renting a car in Montenegro can be done, but it’s good to plan in advance. Find a good Montenegro rental care deal here. You can get a local driver and be driven around. Get an online quote here. For the especially adventurous among you, there is a network of buses. Navigating them is quite difficult though. Check out this info by Montenegro Tourism Board. I hope you’re willing to sacrifice some comfort, because that’s the best way how to stay near the most interesting natural sites and at the same time experience some real local hospitality. 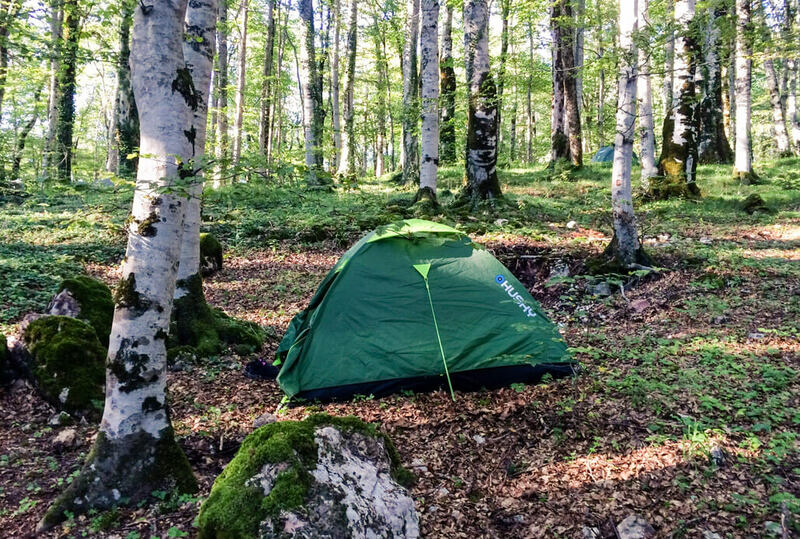 Camping is the way to go for most locals and travellers from other countries in Eastern Europe. Nothing beats a lovely evening by the bonfire with local beer/wine and likeminded travellers and locals! Alcohol, if you want to be like a local. Or ideally – buy it locally! 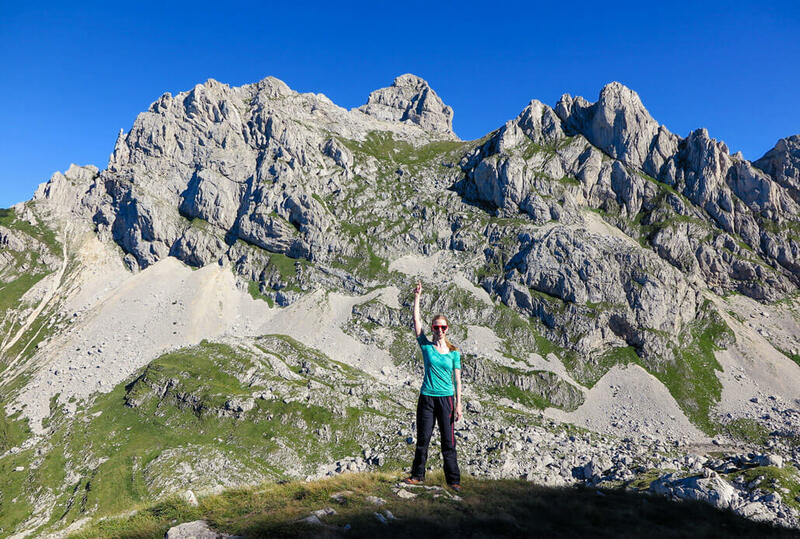 I visited the mountains of Montenegro with a Czech travel agency specializing in outdoor trips: CK Mundo. The trip was not sponsored. I was very satisfied, though! In case renting a car and figuring out best routes sounds like too much work to do, you can look for a relevant travel agency for yourself. Have you been to the mountains recently? Where was that? In case you plan to drive around and explore more countries in the region, don’t leave out Volosko, in Croatia! That is, if you are interested in small and beautiful fishing villages by the sea. Read all about Volosko in my previous post. Forget Golden Circle. Go to Snaefellsness Peninsula instead! That definitely looks like a great adventurous challenge! I like!! Thank you Jacomijn! Yes it was, so beautiful! 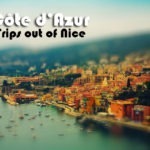 I’m sure you’d love it there as well! This place looks and sounds incredible. Great photos and information! You’re absolutely right, Renuka! And the views were even more breathtaking in real, I still feel the photos didn’t do it justice. Looks like you had a spectacular adventure, Veronika. Yes to all of these adventures, and definitely try to make Prokletije happen next time. It is really special. Also, let us know if you are coming back. We are developing the Meanderbug farm stay network in all of these areas so adventurers can stay in traditional farms inside or near the national parks and have farm to table foods. Would love to show you more local options that really immerse people in the local culture. Hello Brit, yes, absolutely! Thank you for your comment and your email, to which I’ll be replying soon ;) Greetings to my favorite Balkan country! This is so helpful! Thank you for sharing your experience. We’re really excited to hike in Montenegro. Hey Sabrina, yey, enjoy it to the fullest! Wow, these mountains are nice! I’d love to do some hiking over there one day. Excellent post! This was tremendously helpful when we were planning our trip to Montenegro. We did visit Prokeltije National Park and it was spectacular. If you decide to visit in the future, you can check out our guide.